Check out this used 40' Shannon yacht for sale in Florida! : Atlantic Yacht & Ship, Inc. This beautiful used 40′ Shannon yacht for sale is being offered by John Slate of our Florida office! In this first place, this used 40′ Shannon yacht is stunning and unique. Known as “Ravello,” this used 40′ Shannon yacht was launched in 2004 but is in great shape. 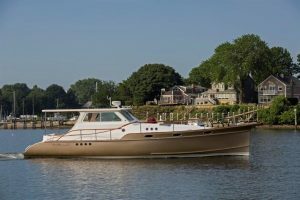 Comparatively, the mechanical, paint, and interior appointments on these boats are the best currently available. They are the finest example in the new movement to refit brands to be the best. When you combine that with the twin Yanmar diesel engines you can easily cruise at 20 knots! The original hull on this used 40′ Shannon was taken down and refurbished from the stringers up in 2016. Furthermore, the hull has a U.S. patent and offers one of the best rides at sea. Moreover she is truly unique and will offer her owner an one of a kind experience. In a sea of cookie cutter yachts, this will set you apart and make you the talk of the dock. In essence, you don’t accept mediocrity in any avenue of your life. Your yacht should follow suit! For more information on this gorgeous used 40′ Shannon yacht for sale be sure to contact John Slate today!